Liferea, a free feed reader for Linux desktop, has updated to v1.10.10 with various bug fixes and improvements. 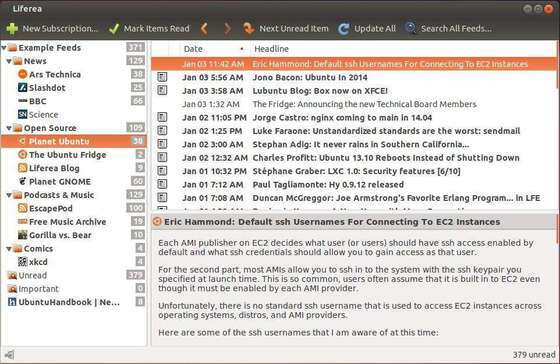 Liferea is an abbreviation for Linux Feed Reader. It is a news aggregator for online news feeds. It supports a number of different feed formats including RSS/RDF, CDF and Atom. There are many other news readers available, but these others are not available for Linux or require many extra libraries to be installed. Liferea tries to fill this gap by creating a fast, easy to use, easy to install news aggregator for GTK/GNOME. The latest release available in PPA for Ubuntu 14.04 and Ubuntu 12.04. Once installed, open it from app menu or unity dash.